Over the last couple of years, myself and Adam have got in quite a few games of SAGA which I have really enjoyed. 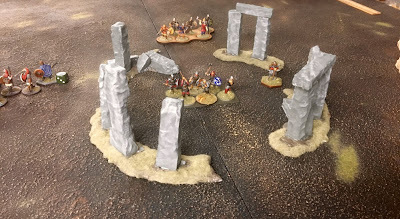 The game is quite different from the other skirmish games I play as there really is no good Command and Control mechanism and it is a simple IGO-UGO game. It really is not a historical simulation and has elements of both tabletop gaming as well as board games. 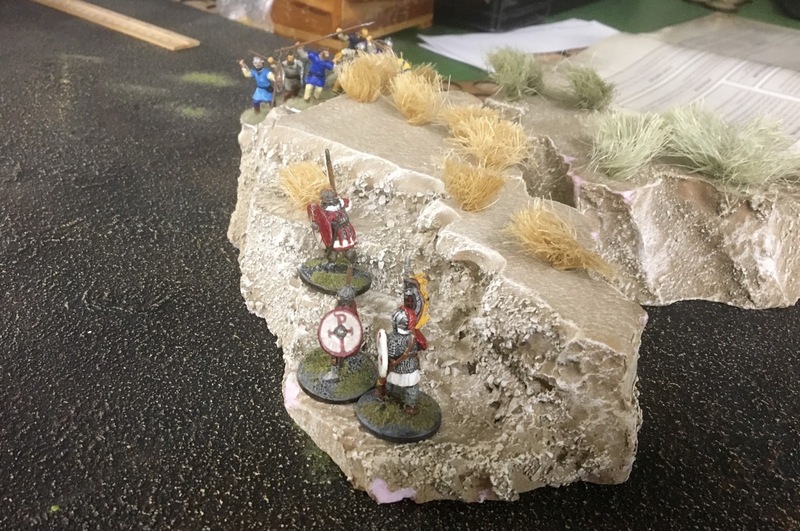 At the same time, the Battleboards and SAGA dice give it a really tactical depth, while the individual figure characteristics (a problem I find with a lot of the new Osprey Skirmish games) are kept to a minimum. Hearthguard are all hearthguard and so on. The movement, shooting and melee mechanisms are all quite simple and easily remembered. Sounds simple does it not, but the Battleboards and the SAGA dice really lift this with the player having to make some very complex tactical decisions in each turn which not only effect that turn but also the next. As you can guess, I quite enjoy this game. We have been playing with factions from the main Dark Ages ruleset but last night I decided to play the Britons a faction from the Aetius and Arthur supplement. It was a fun game and as promised we had no difficulty matching warbands from eras 500 years apart. I also have a Moslem warband ready to go from the Cross and Crescent supplement, so more to come. It was also the first time I played a non generic Warlord, I could not resist fielding Arthur, King of the Britons. I hardly every play warbands with Hearthguards and using Arthur required using a all Hearthguard warband! The Briton Battleboard had lot's of interesting options. We had a good game, I am sure Adam will have a Action Report soon up on his blog; the Fencing Frog but I did take a couple of photos. WHich of the new books did you like the best? Not taking the Battleboards into account I would use the Crescent and Cross rulebook, it is much better written then the original Dark Ages book. 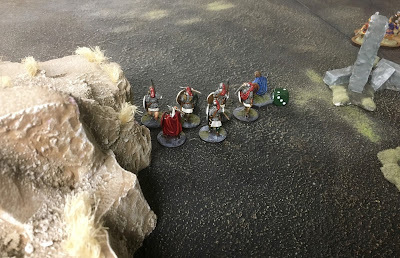 As a supplement I like the Aetius and Arthur has it has a really nice campaign game in it. I am hoping we will try it this year out in Winnipeg. It does seem like fun.